Delta became the latest airline to succumb to a massive IT failure last month. It was a total meltdown for all platforms as Delta.com and the Delta app were both inaccessible which led to a nationwide grounding of all Delta domestic flights. Late that night, operations gradually came back online, but updates were being announced individually for each airport, still leaving many travelers confused and without flight options. Delta’s response to this disaster was pretty pathetic from customers’ standpoint. They issued a waiver stating that passengers may receive a refund without a cancellation fee if their flight was delayed by 90 minutes or more or outright cancelled. What makes this so bad is that Delta’s standard policy only requires a delay or change of 60 minutes in order to allow customers to make changes for free (see screenshot below). Delta has been a very reliable airline for a long time and hasn’t typically needed to do mass re-bookings for delayed passengers. In fact, they went so far as to end their interline relationship with American, which significantly reduced their capacity to book passengers on other airlines in cases like this. Now at a time when Delta’s customers needed help the most, Delta became stingier than ever. 1. 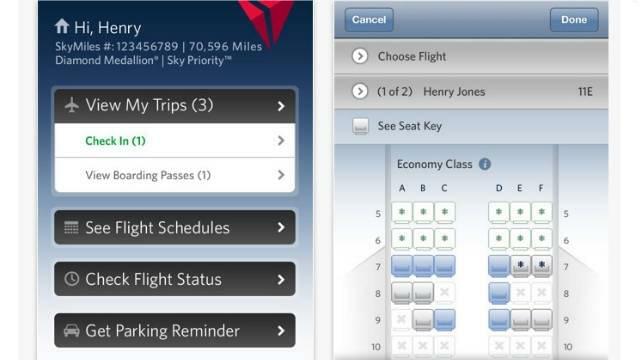 Don’t completely rely on mobile apps for your boarding pass. At the very least you should at least take a screenshot of your boarding pass or download a copy so that if the app becomes inaccessible, you still have it available. You can also go a step further and keep a physical copy as backup, in case your phone battery dies or is damaged. 2. Have a plan for emergency flight bookings. If your flight is cancelled or delayed, the airline should rebook you on another flight. However, as we saw above with the latest Delta fiasco, you may not have been delayed by enough to qualify for a free re-booking. Even if you are re-booked, the airline’s alternative may result in a missed connection, meaning you will still need to change one of your segments. To prepare for these situations, look at alternative flights before the day of your travel. Make a list of airlines, flight numbers, departure times, and prices so that you know exactly what flight to book without any additional searching. If there is a massive nationwide grounding, there will be a ton of people trying to re-book flights and seats will sell out quickly. Put yourself in position to be toward the front of the herd. 3. Diversify your stash of points and miles. It’s a good idea to have enough points and miles in each major program to at least pay for one domestic roundtrip award. That way you don’t have to limit your options if flights on your primary carrier are unavailable, and won’t be forced to pay out of pocket before at least considering award options. This doesn’t mean that you need to actually keep miles in each frequent flyer account; holding points in transferable programs with instant transfer times works just as well and prevents you from having to worry about mileage expiration dates. Chase Ultimate Rewards transfer instantly to United and Amex Membership Rewards transfer instantly to Delta. SPG points transfer to American, but it can take a couple days, which is not acceptable in emergency situations; therefore American is one exception where you may actually want to keep miles in your account. Also don’t shy away from low cost carriers such as Frontier and Spirit. They may not be luxurious, but they could save you hundreds of dollars in last minute situations. 4. Keep a stash of fixed-value points. If you are booking an emergency ticket at the last minute, there’s a good chance that no saver level award space will be available. You could book at standard level rates, but most travel hackers would prefer not to use so many miles on such low value redemptions. As an alternative, you could redeem fixed-value points for a high priced ticket. Examples of fixed (or semi-fixed) value points include US Bank Flexperks, Barclaycard Arrival Miles, and Capital One Venture Miles. These are redeemed similar to cashback and can be all be earned at a rate of 2 points per dollar via credit card spend. 5. Have a lounge membership or access benefit. If your flight gets cancelled or significantly delayed, you may find yourself stuck in an airport for several hours. This experience will be significantly more comfortable if you have access to a lounge. If you are a top-tier elite with a big three airline you should already have access, but for everyone else, there are a variety of credit cards offering various lounge memberships or access benefits. Co-branded airline cards come with benefits for each airline’s own network of lounges, while premium bank cards typically come with access to lounge networks that are unaffiliated with specific airlines. Also, if you are traveling with family, friends, or colleagues who don’t have access to lounges in their own right, pay attention to which cards offer lounge memberships with complimentary guest access. Delta is stingier than United and American in this regard.